Oh yeah, this is technically my personal blog. So I guess I should write about how I smashed my face open the other day eh? OK so let me explain. 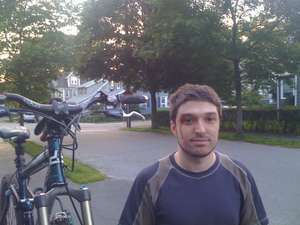 Me and my buddy Greg were biking in the Burlington Landlocked Forest. Most of the trails were kind of 'untechnical' but there were a few interesting structures here and there. The one very cool area was a downhill trail with these two massive inline wooden ramps. They weren't really what you would call jumps. More like launch pads. You just float off of them, get an amazing amount of air, and land probably 20 feet down the trail. When at the bottom of these trail, there are two dirt jumps. The one on the left is like a newbie dirt jump, and the one on the right is more of a big boy dirt jump, although it's hard to get a good angle on it. So we were biking in these woods for a good 3.5 hours. We went down that "jump line" several times. We went all over most of the rest of the woods too. There must be easily 20 very old junked cars in this place too, its so strange. So on the way home, we decided to stop at the Melrose skate park. It's a tiny outdoor skate park. It only has 3 objects, one barely counts. So I see it and I think, meh this place is tiny I'll just sit on my bike. So I grab my gloves, and leave my pack and helmet in the van. Object one is a miniramp, object two is a mini box jump. So I go up to object 3 which is like a ramp towards the box jump. I hit the mini box jump backwards (up the flat side, down the curve side). But I forget that it's only 1.5 feet tall, and not 5 feet tall. I went big, and I landed in a massive nose dive probably 6 feet past the landing ramp. I'm also riding my mountain bike, not my park bike. My 6.5" travel mountain bike. It's a tall bike, so if you go over your handlebars, you're falling down a long distance. So I smacked my face and started gushing blood all over the place. I also scraped my knee, right shoulder. I also have a sore left wrist, sore left and very sore right shoulder, and my right hand is fucked. It felt like someone whacked my right hand with a sledge hammer. This was Sunday so 4 days later its actually doing much better and I plan on riding tonight. So I don't crash often but when I do, I crash big. Better crash on a skate park than on highland mountain I suppose. It was a very stupid crash though. 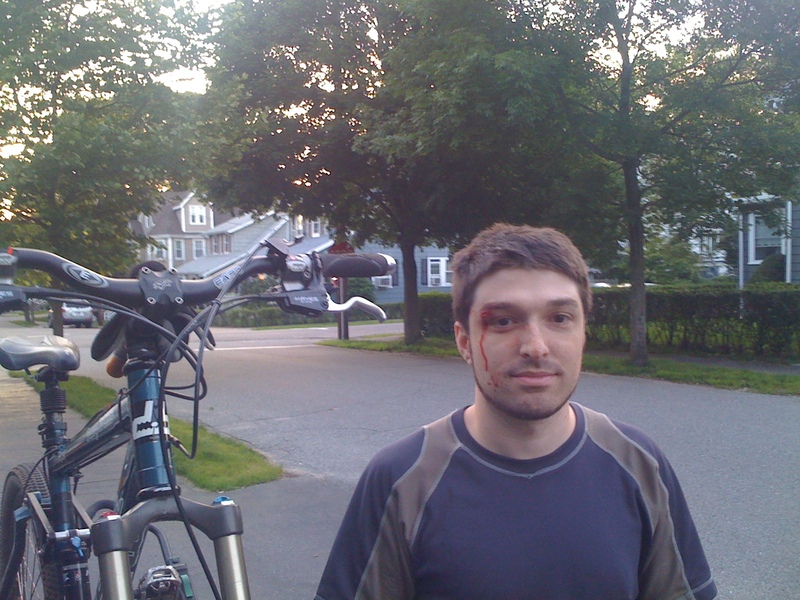 I shouldn't have been riding that bike in a park, I shouldn't have hit the ramp the way I did, and of course I should have grabbed my helmet before trying something dumb. And no there is no video of it. Don't you think I would have posted that already!